Research at Southampton is placing the UK at the forefront of the global data revolution, transforming open data initiatives across the United States, the EU and G8. Opening up data has lowered barriers to data access, increased government transparency and delivered significant economic, social and environmental impact. Data is generated by many crucial social processes, yet the potential of vast swathes of information remains untapped. Successive UK governments have recognised that greater openness about spending can cut waste and increase value for the taxpayer particularly in times of austerity. Researchers from the University of Southampton have played a pioneering role in meeting the challenge to open up these millions of items of data to the public. Society is changing because of major developments enabled by the Web. Open innovation allows anyone to participate and contribute to the generation of new insights, content and knowledge. It challenges those who have a vested interest in closed data and methods, restricted markets and knowledge. The next generation will have at their disposal a web of linked data. They will be able to find things much more easily, leading to the rapid emergence of new ideas, products and services, disrupting existing business models. The web connects people, computers and data to produce systems much more powerful than the component parts. These systems will be essential to solve the challenges humanity faces, from climate change to public health, social inequality to crisis management. Research at Southampton has driven the development of the open data movement, showing how transparency of data can revolutionise how business is conducted, how communities work together and how public services are delivered. Southampton Professor of Artificial Intelligence Sir Nigel Shadbolt has directed the EPSRC’s Advanced Knowledge Technologies (AKT) project that has sought to harness the power of data by developing new ways of standardising how it is presented online. The AKT project also influenced the development of the Semantic Web that aims to transform the unwieldy, unstructured information online into a machine-readable web of data. A collaboration between the AKT project and the Office of Public Sector Information led to the UK government identifying linked data as a way to publish public sector information. The pilot study showed that governments and public sector bodies could adopt Semantic Web technology to disseminate, share and use non-personal public data. Following on from this project the research team has been awarded additional funding to carry out further research into the Web of Linked Data. Research at Southampton has revolutionised access to data across all sectors of UK society, as well as influencing open data movements in the United States, Europe and globally through the G8. 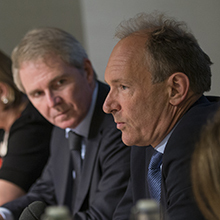 Following the success of the AKT project Sir Nigel and fellow Southampton Professor and inventor of the World Wide Web Sir Tim Berners-Lee were appointed by the then-Prime Minister to apply their research to making government information publicly accessible. Their briefing to Cabinet in 2009 led to significant policy change including the release of 40 per cent of Ordnance Survey’s geographical data for use by government, businesses and individuals. In collaboration with web developers, politicians and civil servants, they oversaw the design and implementation and launch of data.gov.uk that provides access to 10,000 government datasets including crime, health and education. The pair also cofounded the £10m Open Data Institute (ODI) that aims to support the publication and exploitation of high quality open data from across the public sector to help new and existing businesses that want to use this data to create economic growth. The ODI is currently incubating 10 start-ups, one of which identified annual savings of £200m for the NHS by analysing drug prescription practice. The ODI has had more than 3,000 visitors; received delegations from approximately 20 countries; provided training; and raised an additional £4m in funding. Sir Nigel has also been appointed to chair the Local Public Data Panel to provide independent advice on the release and use of local government public data, overseeing some of the most significant data releases including details about local government spending. Research and leadership at Southampton has also led to the drawing up of the UK Public Data Principles that were enshrined in the UK Government Open Data White Paper, while the team’s expertise has been called upon to help ensure privacy protection is embedded in any transparency programme. Talk to our research team and find out more about this work. Professor Sir Nigel Shadbolt, of the Web and Internet Science group led the research on this project.